I am presently conducting Workshops in Vedic Mathematics for school children. The following article on "Multiplication on Finger Tips" will appear in my compilation on Vedic Mathematics, which I hope to publish soon. During my Lectures, I found many children and parents fascinated by the method of doing multiplication of 9, 19, 29, 39, etc. on hand. I believe it will likewise generate interest in others also. Multiplication Tables of 9, 19, 29, 39, etc. on hand. We have the answers at the tip of our fingers, literally. Isn't it wonderful. Even a child can give the answer for 6 x 79 within a few seconds by this method. We have 10 fingers in our hands. Keep the palms with fingers spread turned towards your face. Fig.1 shows the fingers numbered from 1 to 10, so the left thumb is 1 and the right thumb is 10. The numbers shown against the fingers in Fig.1 are the values attached to those fingers and represent the multiplier. For example in 9x3; 9 is the multiplicand and 3 is the multiplier. Similarly in 19 x 6, 19 is the multiplicand and 6 is the multiplier. 1.. The folded finger represents the multiplier. 2.. Consider any finger to the left of the folded finger as representing the digit in the 10s place and those to the right represent the digit in units place. (Eg.1) Consider the multiplication table for 9. 1.. Fold the thumb of left hand (to represent 1 in 9 x 1). Since all the remaining 9 fingers are to the right of the folded finger, we have 9 units. 2.. Fold the index finger of the left hand (representing 2 in 9 x 2). Now we have the thumb to the left of folded finger and 8 units to the right. The thumb represents 1 Ten. 3.. Fold the small finger of right hand (representing 6 in 9 x 6). Now we have five fingers to the left and 4 fingers to the right of folded finger. The five fingers to the left represent 5 tens. Hence 50. The four fingers to the right are 4 units. (Eg.2) Multiplication Table of 19. In this case we proceed as explained above, but to every tens digit, we add the digit represented by the folded finger. The folded finger represents 1. There is no tens to the left of the thumb of left hand therefore we get 1 in 10s place. Consider 19 x 2. We fold the index finger of left hand representing the multiplier 2. There is 1 ten represented by the thumb to the left of the folded finger. Hence, adding the 2 (multiplier) to 1, we get 3 in tens place. There are 8 units to the right. The method is exactly as explained above, only we add twice the digit represented by the folded finger, (i.e. the multiplier) to the number of fingers to its left. In the case of multiplication table for 39, we multiply the digit represented by folded finger (i.e. the multiplier) by 3 and add it to the tens represented by fingers to the left of folded fingers. We can extend the above logic for multiplication tables of 8, 18, 28, etc. also on hand. This course of three books, plus Teachers Guide and Answer Book (formerly entitled The Cosmic Computer) is now printed and available. The publishers are Motilal Banarsidass. The price is 795 rupees for the set. Books can also be purchased separately. Here are the publishers details should you wish to contact them. 41, U.A. Bungalow Road, Jawahar Nagar, Delhi-110007, India. Tel: (011) 3974826, 3918335, 3911985, 3932747, (011) 5795180, 5793423, 5797356. We will let you have more details when we can. There is a new web site on Vedic Mathematics: http://www.geocities.com/vedicmathematics. This features the work of Dr S. K. Kapoor who believes that the logical problems that have beset modern mathematicians (like functions that are continuous everywhere but differentiable nowhere) are due to certain basic axioms used in modern mathematics. This problem is solved with Vedic Mathematics. Here is an extract from the web site: "Dr. Kapoor is attempting to reconstruct the discipline of geometry as a discipline based on Vedic concepts. He has designated this discipline as Vedic Geometry. His results have added a new dimension to the dialogue initiated with the interpretation of the Ganita Sutras and their potentialities brought to focus by Swami Bharti Krisna Tirthaji Maharaj." Software is being developed to teach mathematics, incorporating Vedic mathematics, modern computation and traditional Irish cultural knowledge. A demonstration of this software should be available on the internet within eight weeks. If anyone would like further information or could help to create a Simple Sums web site they may contact Dr. Brian McEnery at . Also it is timely in it's development as, for the first time calculators will be used throughout secondary schools in Eireland. This is unfortunate unless a really new innovation takes place. What makes this anicalc different to a conventional calculator is that the child (or adult) is shown the process of the calculation while it is being done, and can be encouraged to perform parts of it, mentally. As well there are the special mental mathematical techniques of Vedic Mathematics, which introduce a degree of liveliness and interest which is absent from conventional methods. We will keep you informed. 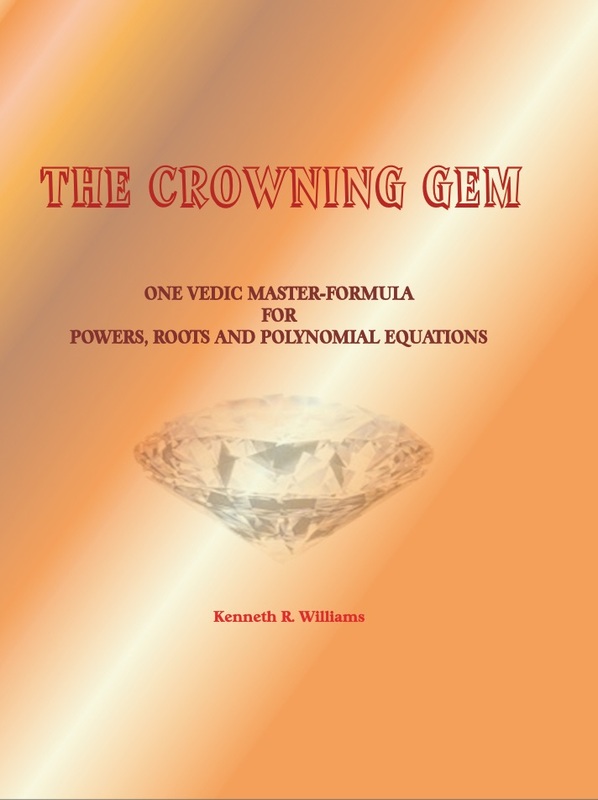 Vedic mathematics continues to be of great interest in India. Workshops on 28th - 30th January given by Mrs Rajeshwari Sharma in Mumbai were a big success. She writes: "I explained the different methods of multiplications and squarings and cubings knowing well that they will be of great use to the children of 9th and 8th standard. I also showed them the verification by digital root method. That was very well appreciated by both the students and the teachers. I also showed them multiplication tables of 9,19,29,39 etc., on fingers and they were all very fascinated. Except the 9 times table (which is known to many) I had worked out the logic for the other tables myself. I also enjoyed giving the lecture since the children took so much interest and took active part in the same by coming to the board and working out the problems themselves. The principal came on the second day and congratulated me told me that the teachers and the children liked my approach to the subject." One of the young participants at this event wrote afterwards: "Your lecture on Vedic Maths was like an expensive medicine given to a wounded soldier on a battlefield fighting for his country. As we are fighting to score in maths for the board exam as one of the weakest subjects. It is surely a good and a magic like subject for a weak student. Thank you for the wonderful lecture." Following the successful course at Imperial College another one is planned for next term. We will keep you informed about the details. therefore the answer is 1892."